True confession time. I had grand plans for this post before our 30 Days of Forgiveness began. I was going to have a downloadable copy of my version of The Violet Flame meditation available for anyone who is participating. I was even hoping to record an MP3 of the meditation that I could make available. But here I am, the day before the post is scheduled, and I have neither of those things done nor the time to do them today. Last night I did the Violet Flame meditation before I went to sleep and asked to know what this post should look like when I woke up this morning. And this is what I got: Tell the truth. Forgive yourself. Let it go. So, that's what this post is all about. 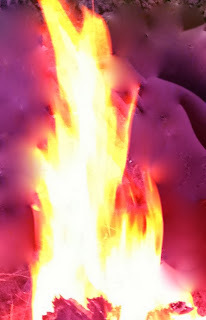 Another great way to do forgiveness work, is to use The Violet Flame Meditation. The Violet Flame Meditation was given to mankind by Ascended Master Saint Germain for the purpose of transmuting negative energy. I learned this meditation from my friend Cindy, a gifted psychic and fellow seeker. I have been practicing this meditation for around ten years and have found it to be extremely beneficial in helping me to release negative energy, loosen blocks in my physical body and open my heart. I use it almost daily to keep both my physical body and my energy body (aura) cleansed and clear. In lieu of downloads or an MP3, I will be offering a FREE Violet Flame Meditation class next week in honor of 30 Days of Forgiveness. The class will be held on Tuesday, January 28th at 7:00pm at Mosaic Coffeehouse in Seattle, WA. In this class you will learn how to connect to Source, ground yourself into the center of the earth, to place protection around your physical and energetic bodies to protect yourself from negative energy in your environment and to use the Violet Flame as a tool for forgiveness.